A very entertaining anime about a mad scientist who successfully manipulates time that allows him to travel to the past to change the future. I deep sci-fi anime that requires lots of knowledge about time travel, science and chaos theory. Time travel sci-fi has always fascinated me and Steins;Gate has no doubt satisfied my every curiosity about time travel and chaos theory. In fact, I pretty well understood the anime right from the start. If you have never heard of John Titor, the LHC and the 'Butterfly effect' then its best to do some pre-reading on those topics. 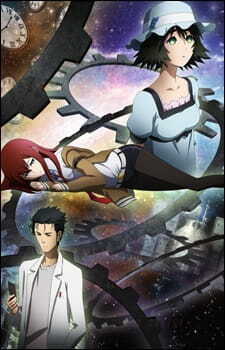 Then, you may understand a bit more about Steins;Gate. Also, some internet culture would help as well as the anime does touch on some internet meme aspects. Well, enough of the background, time to talk about the story. Three words: I loved it. It was just what I wanted from a time travel anime. Manipulating time and changing the past to effect the future just hooked me from the very start. Such anime obviously brings out many questions such as 'How does changing the past effect the future?' and 'What about time paradoxes?' or 'What about the memories of the people who time travel?'. These questions are more or less answered as you watch the anime. Hence, most explanations are clearly explained in scientific and logical detail. To a degree, it makes realistic sense, but at the same time, this is just a fictitious anime so don't take it seriously. The art was was well illustrated. The characters all looked aesthetically pleasing and natural. The time leap effects and nostalgic flashbacks all looked wonderful with their own respective use of dark overtones and flashy effects. Overall, I have nothing to complain about the art. It was good. The voice acting was perfect. Although, the main character, Rintarou got a bit annoying due to his 'mad scientist' personality. It may get on your nerve sometimes at how naive he is to a current situation. Other than that, the other characters were well voiced. I loved Rumiho with her constant cuteness and the use of 'nyan' in almost every sentence she says. Let me talk about the theme songs. They were good! So catchy that I even downloaded the OST. This adds to my anime music collection which only consists of K-On, Angel Beats! and Gosick. Very well compiled soundtrack throughout the whole series. I loved the characters, except for Rintarou. Well, I didn't mind him, but his attitude gets slightly annoying from the constant 'mad scientist' rave and delusional monologue he always does. Foe most of the anime you will be seeing him talking on his phone to himself. You might call him 'mad' alright. Moving on, the other main character, Mayuri is always cute and cheerful as ever. With her constant 'du du lu' greetings to everyone she meets and her naive attitude just gets to you, Speaking of cuteness, Rumiho is also cute with her constant use of the word 'nyan' in many of her sentences. Finally, Kurisu is just cool. Plain cool. Her clothing style just speaks for itself. Anyhow, that's my quick round-up of the characters. Overall, I loved this anime. Anything with time travel just interests me. So if you are a totally sci-fi anime fan, you will love the action, time travel and chaos theory all mentioned in this anime. Be warned though, it may seem a bit confusing at first, but if you know a bit about John Titor and internet culture then you should be fine. Loved it! Never got boring. The story just made sense. Really well illustrated and animated. Expected from such a good anime. Voice acting was superb and the theme songs were really catchy. The characters were varied, even though they were all on different world lines, you still felt an attachment to them. Sci-fi + time travel + chaos theory + internet culture = one awesome nerd anime series. Loved it. Captivated me from start to end.